Crunchy, tasty, sweet and salty. I’m one of those people who likes their sweets to be slightly salty. I don’t cook with a lot of salt, preferring to use herbs and spices. I’ve bought into the ‘fact’ that too much salt is bad for you. However, there was a credible article in the Sunday Times the other week, highlighting new evidence which showed that the low sodium diet was as damaging as the high sodium one. My father has always just tipped the salt pot upside down and sprinkled it liberally over his plate, often then creating a small salt mountain on the side of the plate to dip forkfuls of food into. He’ll be 95 in a couple of months, so his super-high salt diet hasn’t exactly limited his life too much. Anyway, although I like my sweets salty, I’m less keen on my savoury dishes being too sweet. I’m not a big fan of putting fruit into a stew or casserole. My exception is good redcurrant or rowan jelly with a roast meat. Or a not-too-sweet apple sauce with roast pork. But back to the salty sweetness. When I was in the US last year, with a work colleague, we discovered Nature Valley’s Sweet and Salty Nut Granola Bars. It was love at first bite for me. They aren’t available here in the UK, although there’s a huge variety of similar products. But I can’t be trusted in a sweet shop, so have to confess I haven’t tried terribly hard to find a suitable substitute. I hadn’t thought of making my own. Why hadn’t I? I must be entirely mad. 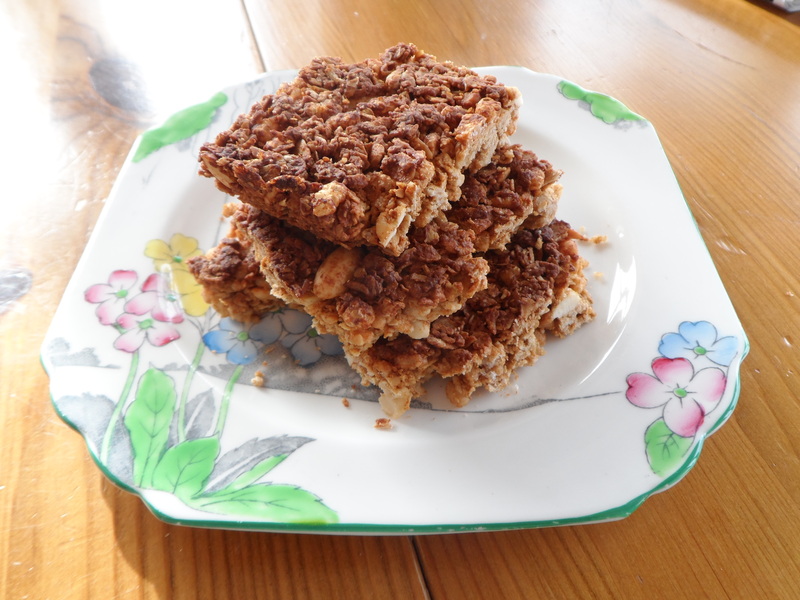 Anyway, once the thought came to me, I flicked through all my recipe books and scoured the internet for the perfect sweet and salty crunchy nutty bars. And then I adapted. This isn’t entirely true. I can’t lie. What really happened is that I came across a recipe on Half Baked Harvest’s blog and decided it was time to get experimenting. This recipe is adapted from hers. It is the perfect crunchy, sweet, salty, nutty snack. But it’s not as healthy as eating an apple, so although they are addictive, try to ration them. Pour all this melted mixture into the well in the centre of the dry ingreds. Put in the oven and bake for about 20 mins, or until golden brown. Watch out, it can go from perfect to ‘slightly burnt’ quite quickly. Once it is cool, try to cut it into pieces. You’ll need a sharp knife, and some of it might crumble a bit. Any extra crumbs left, pour into an airtight pot and use for sprinkling over yoghurt, or ice cream or in a crumble. Keep the bars in an airtight tin, for as long as possible. You may need to put them on a very high shelf, out of your reach. Or to give them to friends. Suggested adaptations – you could add dark chocolate chips, or dried fruit (cranberries, chopped up apricots, raisins). Or desiccated coconut. Or, cinnamon would be nice, Or chopped dried apples, with some cinnamon, a pinch of cloves and some ginger. You could probably replace the honey with agave syrup, or golden syrup, although I’m not sure why you’d want to do that. And apologies if you don’t have digital weighing scales. I was old-school for YEARS, but bought a digital set recently (so I could weigh out my 7g of yeast to make home made bread) and it has entirely changed how I bake. Just pop the bowl on the scales and add the next ingredient. Easy peasy. They’re not expensive and take up hardly any room in your cupboard. Isn’t it time to treat yourself? Want to find more of my recipes? Take a look here: Shewolffe’s Recipes. If you like this, you’ll probably like my salty nut brittle, but go see what else is in there. ← Let the growing begin…. How are you finding coconut oil? I like the premise but wonder how it affects flavor.